Special Containment Procedures: SCP-2053-1 is kept in a standard containment locker at Site-██. SCP-2053-2 is to be stored on a 2 GB flash drive in the same containment locker as SCP-2053-1. Once a month, one Level-2 researcher is to remove SCP-2053-1 from this locker and attempt to rotate the object's faces. If unsuccessful, the object is to be returned to the locker. If rotation is successful, testing will resume under the direction of Dr. Boone. Description: SCP-2053-1 is a puzzle cube measuring approximately 5.7cm along each exterior edge. It is physically identical to a standard Rubik's brand puzzle cube. 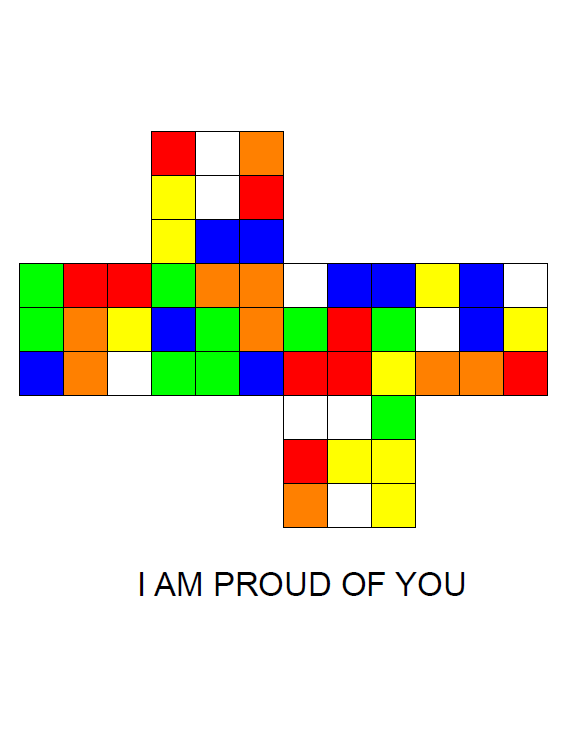 SCP-2053-1 can be solved in the same way that a non-anomalous Rubik's Cube can be solved, by rotating its various faces until all the stickers on each distinct face of the cube are identical in color. The object shows signs of wear and tear, presumably an indication of heavy use; however, tests show that the stickers themselves have never been removed. Occasionally, SCP-2053-1 will enter an active state, during which the object's faces will begin to rotate of their own accord at approximately three rotations per second. After the object has completed several of these rotations, it will enter a passive state for approximately twenty seconds, during which the faces will remain in this permutation. The object will then become active again, and return to its base "solved" state, at which point it will become dormant once more. SCP-2053-2 is a computer file labeled "i_love_you_jake_please_read_this.pdf". The metadata associated with the file show that it is 1.21 MB in size, and it can be stored on any digital media with that amount of available storage; however, the number of pages contained within the document far surpasses the number that should be possible of a file this size. When opened by a PDF-capable program, the resulting document contains exactly 43252003274489856000 pages; Foundation analysts estimate that a non-anomalous PDF document of this length would occupy approximately 2.1 yottabytes (2.1 trillion terabytes) of storage space. Each page of the document depicts a two-dimensional polyhedral net equivalent to a three-dimensional Rubik's Cube. The diagram on each page is colored in such a way that it corresponds to a possible permutation of SCP-2053-1. Displayed below each diagram is an English phrase or sentence in a nondescript black typeface. Using computing assets obtained from ██████ Inc., personnel assigned to SCP-2053 have created a digital database containing all of these diagrams and their corresponding phrases. Of note is the fact that the number of pages in SCP-2053-2 exactly matches the number of possible arrangements of SCP-2053-1. This implies that, for every possible permutation, there is a corresponding phrase. By physically rotating the faces of the cube to match a permutation contained within SCP-2053-2, communication with SCP-2053-1 is possible, using the phrases given in the document. Notes: For the purposes of this experiment (and subsequent interviews), Dr. Boone has set up a device which quickly analyzes each passive state permutation of SCP-2053-1, and cross-references this against the contents of SCP-2053-2 to produce the corresponding phrase. At the same time, another program is used to search SCP-2053-2 for specific desired phrases, such as "WHAT IS YOUR NAME", and translates these phrases back into their corresponding permutations. These two programs are used in tandem, essentially to decode incoming communications from SCP-2053-1, and to encode phrases directed at SCP-2053-1. This allows Dr. Boone to open a dialogue with SCP-2053-1, to determine the nature of the entity associated with it. All of the phrases used during this initial interview appear in SCP-2053-2; capitalization and spelling have not been altered. At this point, Dr. Boone ceases communication. Addendum 2053-01: As of ██/██/████, no progress has been made on the search for the individual believed to be associated with SCP-2053. Addendum 2053-02: The Foundation has located an individual in an extended care facility in ████████, SC who falls under the correct parameters; Jacob ████, age 31, suffering from [REDACTED]. 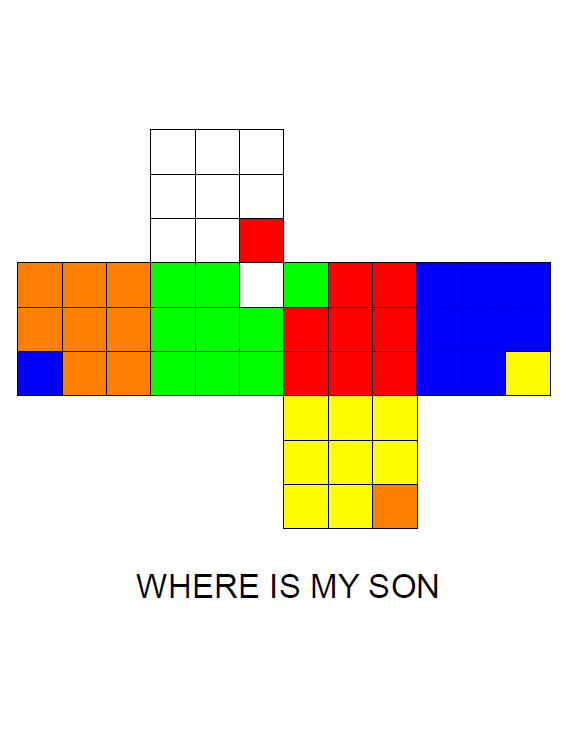 When interviewed, his attending physician commented on Jacob's acute attachment to complex puzzles - specifically Rubik's Cubes - and his skill at solving them. Addendum 2053-03: In all interviews thus far (see Interview Logs 2053-02 through 2053-08), SCP-2053-1 has been unwilling to reveal any information regarding the origin of its current condition to "Jake". In light of this, Dr. Boone has decided to communicate with SCP-2053-1 under the guise of a generic physician (see Interview Log 2053-09 below). At this point, SCP-2053-1 enters a dormant state, apparently "stuck" in this permutation. Since the conclusion of this interview, all attempts by Dr. Boone and assisting personnel to rotate any of the object's faces have been unsuccessful. The following image depicts the page from SCP-2053-2 which corresponds to the current permutation of SCP-2053-1.